Super-realistic face masks made by a tiny company in rural Japan are in demand from the domestic tech and entertainment industries and from countries as far away as Saudi Arabia. 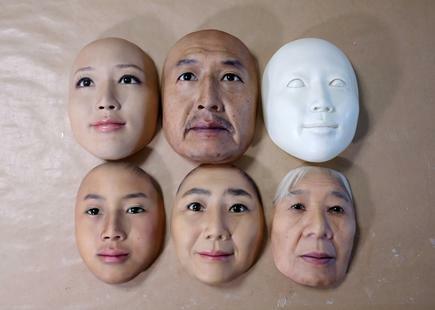 The 300,000-yen (US$2,650) masks, made of resin and plastic by five employees at REAL-f Co., attempt to accurately duplicate an individual's face down to fine wrinkles and skin texture. Company founder Osamu Kitagawa came up with the idea while working at a printing machine manufacturer. But it took him two years of experimentation before he found a way to use three-dimensional facial data from high quality photographs to make the masks, and started selling them in 2011. The company, based in the western prefecture of Shiga, receives about 100 orders every year from entertainment, automobile, technology and security companies, mainly in Japan. For example, a Japanese car company ordered a mask of a sleeping face to improve its facial recognition technology to detect if a driver had dozed off, Kitagawa said. "I am proud that my product is helping further development of facial recognition technology," he added. "I hope that the developers would enhance face identification accuracy using these realistic masks." Kitagawa, 60, said he had also received orders from organisations linked to the Saudi government to create masks for the king and princes. "I was told the masks were for portraits to be displayed in public areas," he said. Kitagawa said he works with clients carefully to ensure his products will not be used for illicit purposes and cause security risks, but added he could not rule out such threats. 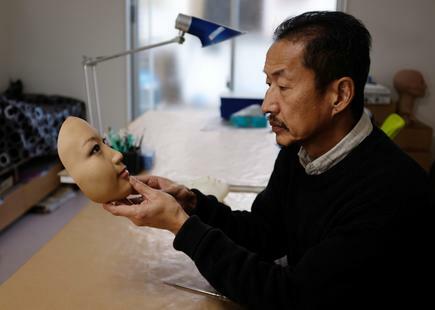 He said his goal was to create 100 per cent realistic masks, and he hoped to use softer materials, such as silicon, in future. "I would like these masks to be used for medical purposes, which is possible once they can be made using soft materials," he said. "And as humanoid robots are being developed, I hope this will help developers to create (more realistic robots) at a low cost."